www.photomacrography.net :: View topic - Variable Oblique ILluminAtion - VOILA! Posted: Sat Feb 23, 2008 5:18 am Post subject: Variable Oblique ILluminAtion - VOILA! I noticed that on my DIC setup, if I used a non-DIC objective without prisms (my Leitz ICT objectives have in-built Wollaston prisms) I got a pseudo-DIC effect. In fact it seems it is an oblique illumination effect .See the link above for an example. 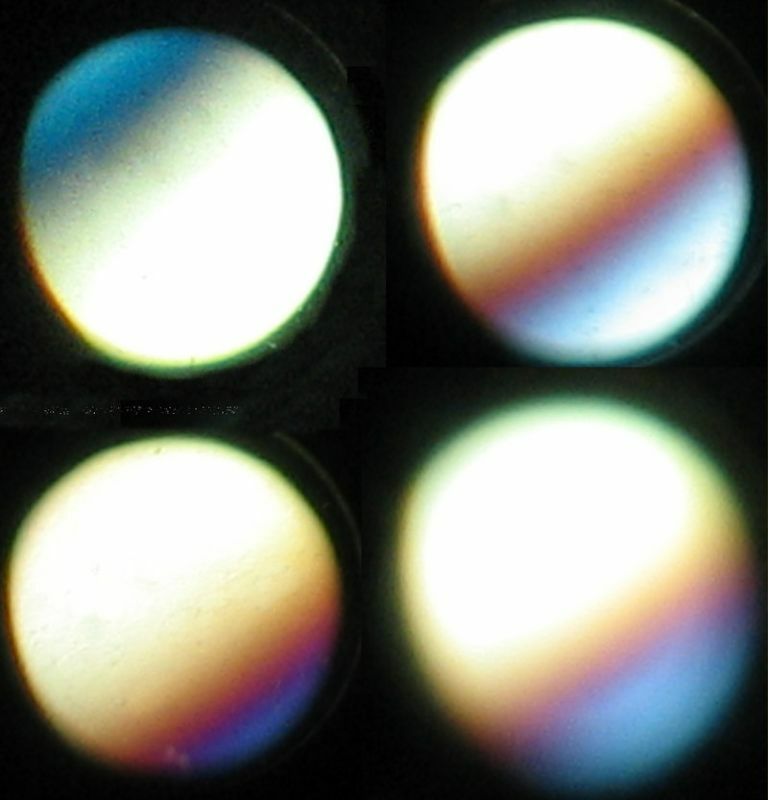 Substage with polariser and Wollaston prism, conventional objective, polariser (analyser) in microsope body, but no Wollaston prism at the objective focal plane. The effect works on any non-DIC objective and appears greatest using the substage Wollaston prism intended for the Leitz x100 ICT objective. It can be varied by rotating the substage polariser and the direction of shadowing reverses as you traverse the fully crossed polarisers position. It appears that what is happening is that the dark band observable at the back lens view of the objective traverses the field as you rotate the polariser (a well known effect, also used in alignment of Wollaston prisms & polarisers for DIC). In so doing, it partially occludes the light, thus providing an oblique illumination effect. Almost a "virtual" oblique illumination, as there is no physical substage oblique stop. Of course, since the dark band only exists above the final polariser, it must be that the effect results from filtering of some of the light by the upper polariser. Without the polariser there can be no effect and none is in fact seen in practice when the top polariser is removed. Effectively, the plane of polarisation of the incident light on the object varies across the field as a result of the lower polariser/prism combination, but as the upper polariser is simply plane polarised, only light where the polarised light is passed by the upper filter can be seen and an oblique illumination effect is observed. 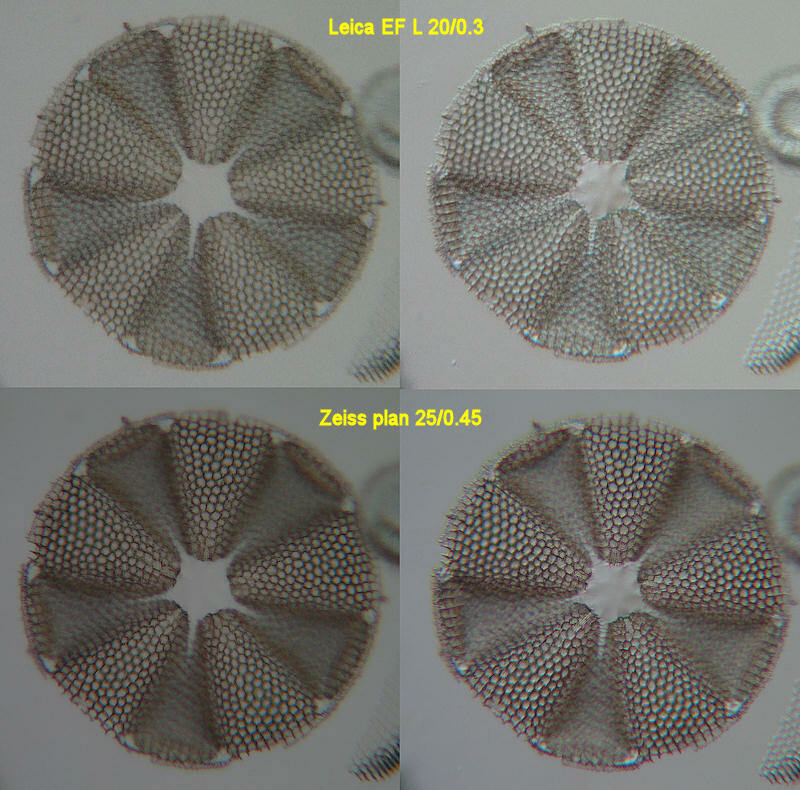 Example pictures showing normal illumination at left and VOILA at right. Charlie said that his set-up is not quite the same as mine, but I suspect if the same combination of prism and polarisers can be achieved, the effect will work. It only goes to show that "poor man's DIC" is even useful for those that have full DIC! Perhaps this is rich man's oblique illumination?! Thanks to everyone who helped with the discussions on this illumination effect. I'll have to try mine in a similar way. I do have a separate upper polarizer that I could use instead of the combined pol/prism needed for DIC. Somewhere I have some polarizing sheet material. It might be fun to make a disk from two half circles, with the polarization axis at right angles to each other. It would seem that if this were placed at the bottom of the condenser, that a rotatable upper polarizer (or even one placed over the light port at the base of the of the stand) would give you a similar "variable oblique" without the need for any DIC prism. Could be interesting to explore.